Quilting is my Therapy, too. Most of the people I know don’t understand why I enjoy quilt retreats; and I’ve never found a good way to explain it to a non-quilter. 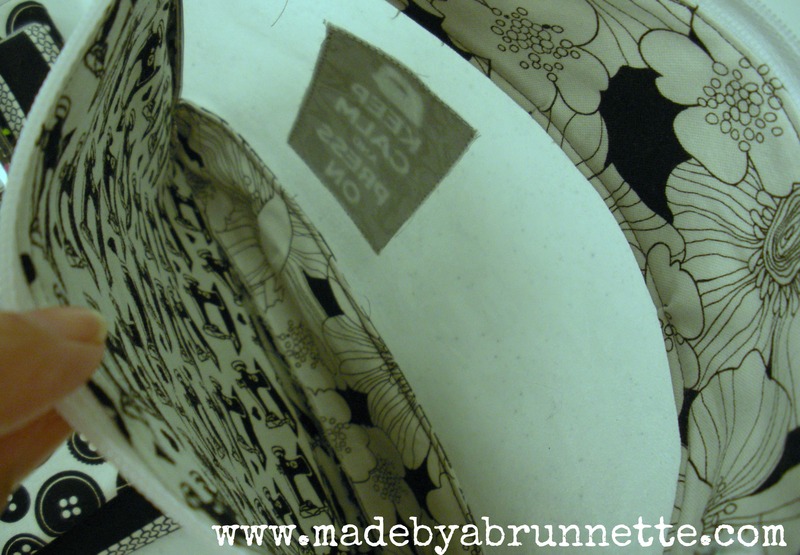 But maybe visually, with a few shots of our sewing space, I can make it a little easier to comprehend. I borrowed this pic from Stephanie, because it is a great shot of the space, the table, and of Rene! 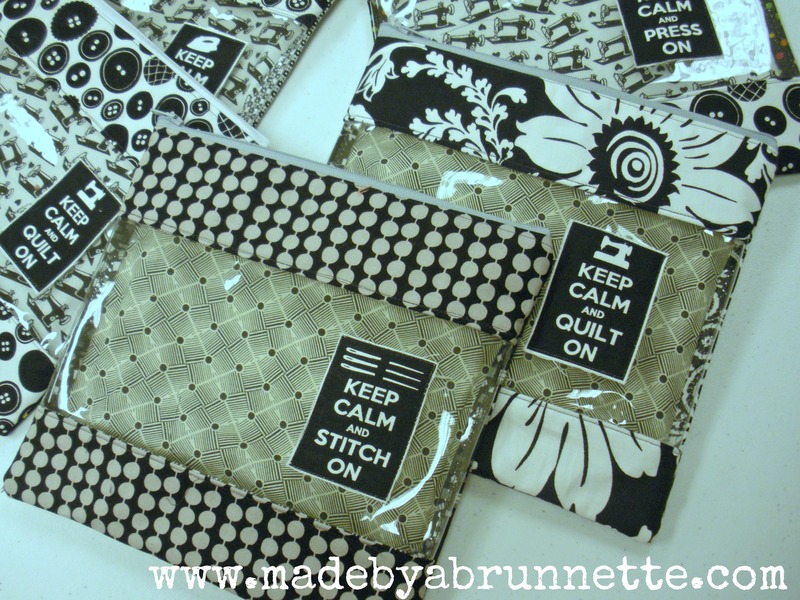 I’m trying to decide if I should write a tutorial for those bags… what do you think? Lucy’s Crab Shack sachets made by Stephanie, along with a copy of The Quilted Fish book she is featured in! 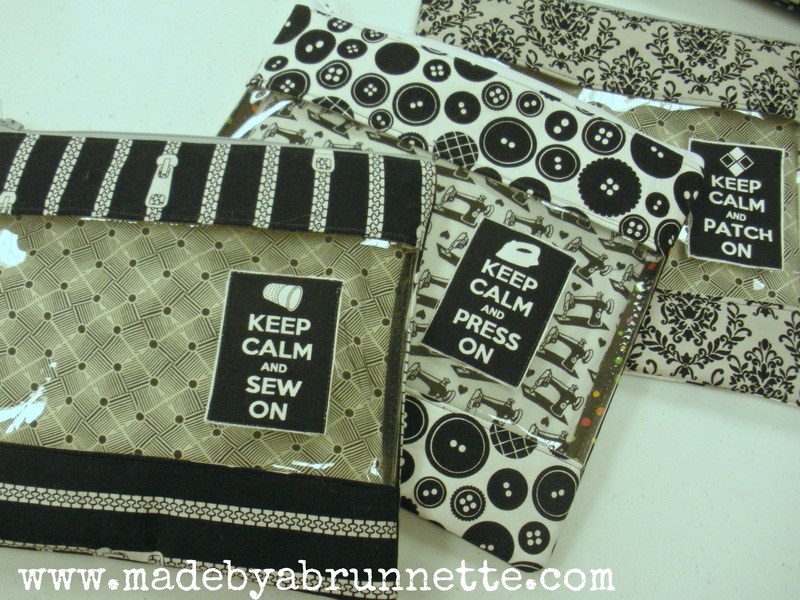 A zipper bag made by Terri from her own Spoonflower designed fabric! Gourmet chocolates and FQs from Rene, each representing part of where she calls home. 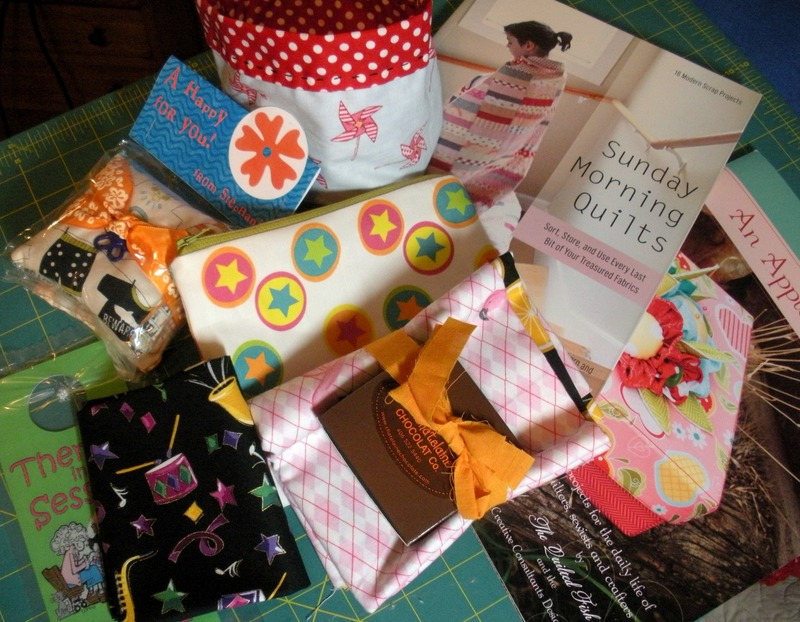 I brought home plenty of things I “treated” myself to in the way of fabric, as well as an autographed copy of Amanda’s book, Sunday Morning Quilts. Such talented friends–thank you all!!! We already have next year’s July retreat booked. 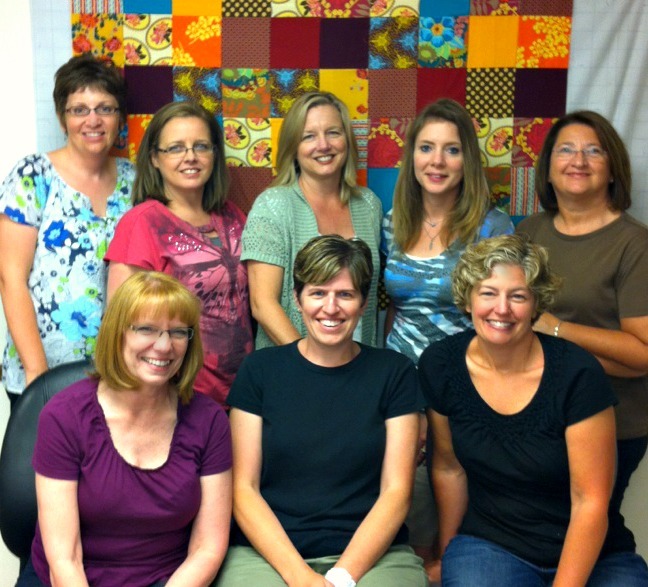 Do you go to quilt retreats? Have a favorite you return to over and over? Does your family or group of friends have a tradition or practice similar to the Harper family practice of giving happies? It’s really hard for me to let my BFF Cindy leave for the retreat! But I can see why she has so much fun!!! She’s coming home tomorrow! Yay! Oh yes, I have a favorite retreat I return to over and over!!! Lucky ME!! 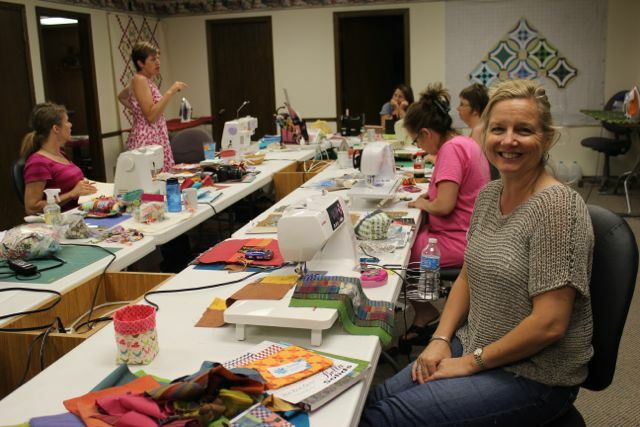 Oh, yes…Quilting is my therapy, too. I have never been on a retreat. I would love to sometime! I haven’t had the chance to retreat, but I know I’d love it. Love all the happies. and those vinyl bags you gave out are just adorable! Glad you got to do this. It’s good for the soul. Love your post. You can have any photos of mine that you want! I’ve got a LOT more! LOL. Love your happies. I just love the bag you gave me and would also love a tutorial! So, YES, please do it! 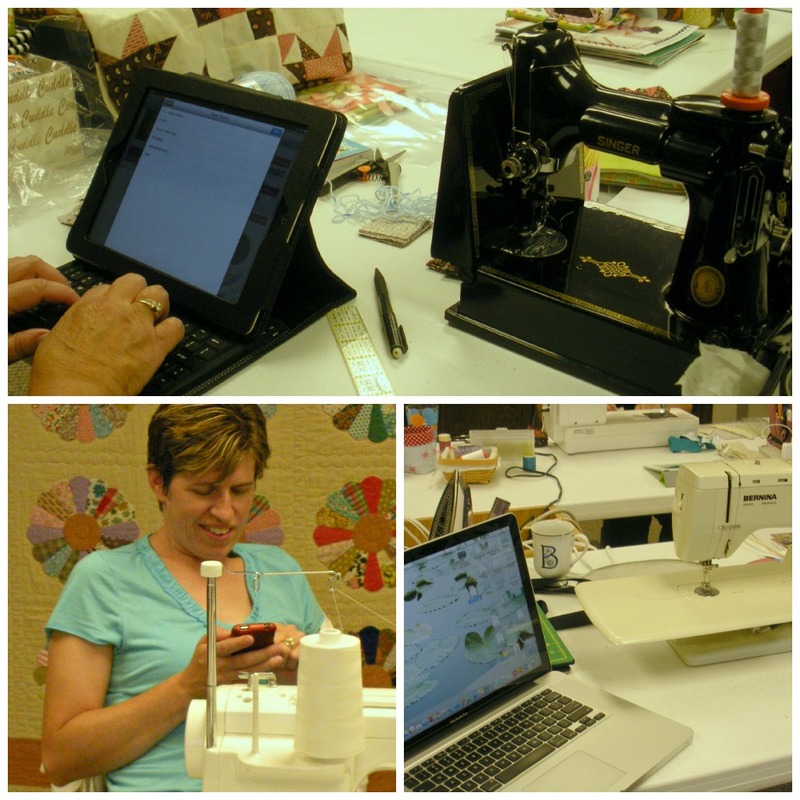 I enjoyed our special time together at the other quilt shop, too, Doris! Keep on smiling! Miss ya! Quilt is my therapy too! It’s a wonderful hobby to have, especially since it brought all of us together. Your recap of our fabulous retreat weekend warms my heart because I never felt so comfortable with a group of women as I did with you all. Well said! Thank you to everyone for the fun happies – I love them all. This is the only retreat I go on. I would love to do more but time and money (and connections, or lack of) have held me back. My family exchanges names at Christmas time; my sister and I exchange handmade ornaments each year; and I do a handmade ornament exchange every year with two blogging friends. Doris, this is a perfect recap of our retreat and why retreating is so important! I need to bookmark this for handy reference anytime someone asks me why I travel so far away to quilt with friends. 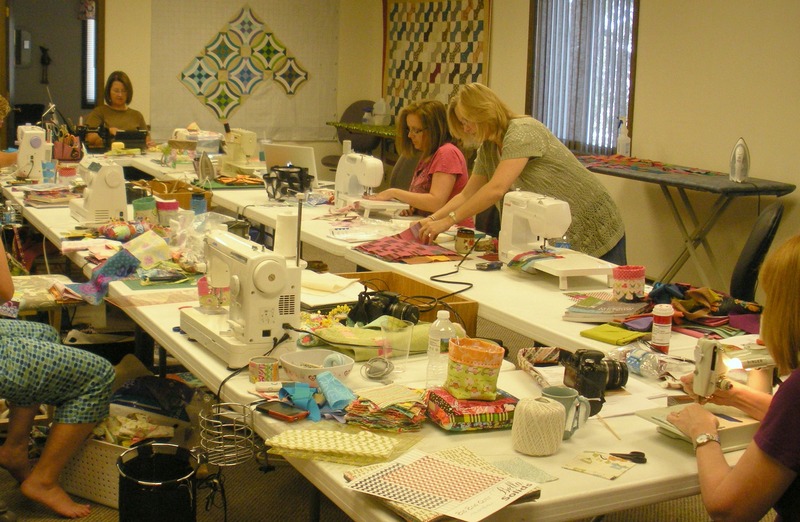 Gruber’s is the only retreat I attend although I am lucky enough to sew once a month (if no conflicts) with my quilt guild friends. Thank you for my lovely happy zipper bag and would love to see a tutorial. Looking forward to our next year’s retreat! What a wonderful recap of such a wonderful weekend. Last year, before I knew you all, I would never have imagined who comfortable I would come to feel with all of you. It will just keep getting better and better.